Published this week by Palgrave Macmillan, a new multi-disciplinary reference work maps the practical issues regarding the morality of how we treat animals. 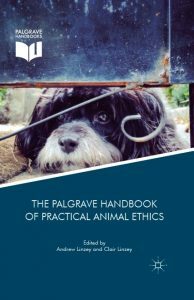 Entitled The Palgrave Handbook of Practical Animal Ethics, the volume comprises 31 authoritative contributions from academics worldwide, including Canada, Germany, Spain, South Africa, Italy, Australia, Brazil, Austria, as well as the US and the UK. “All these academics are pushing the envelope” said the Directors of the Oxford Centre for Animal Ethics, Andrew Linzey and Clair Linzey, who have edited the volume. “Their work reflects a new and growing ethical sensitivity to animals and offers progressive perspectives on how we should interact with them”. The editor’s introduction offers an overview of the challenge of animal ethics, arguing that “there is no one living who is not affected by one or more of the issues raised in this volume”. The volume is divided into four sections – “the ethics of control”, “the ethics of captivity”, “the ethics of killing”, and “the ethics of causing suffering” – respectively edited by Professors Lisa Johnson, Thomas I. White, Mark H. Bernstein, and Kay Peggs. Topics covered include: the preservation of free living animals, staged animal fighting, bio-engineering, killing animals for food, aquariums, sport hunting, angling, religious slaughter, companion animals, intensive farming, zoos, animal experimentation, and the incarceration of marine mammals. No less than five years in the making, the Handbook is the flagship of the Palgrave Macmillan Animal Ethics Series, which comprises more than twenty individual volumes that offer multi-disciplinary perspectives on animal ethics. The volume is a project of the Oxford Centre for Animal Ethics, which is an independent research centre with the aim of pioneering ethical perspectives on animals through academic research, teaching, and publication. Copies for review are available by request from reviews@palgrave.com. The book is available in hardback for £129.99 and in e-book for £103.50. Until August 31, Palgrave can offer a twenty per cent discount, by using the code PM18TWENTY3 on this title and any other in the Palgrave Macmillan Animal Ethics Series, when ordering on www.palgrave.com.